To be fully relaxed, one has to feel safe and secure, and for a dog, there’s no better place to ensure those feelings that around their beloved Mommies and Daddies! Pups love curling up with their parents when they need to sleep, as there’s nowhere they feel more at home and at peace! Louie the golden retriever pup definitely agrees with that sentiment. When he felt a little tired in his home in Los Angeles, California, he clambered onto Mom, rested his head on her lap, and dozed straight off! Now, Mom sits there, gently petting his head, and we’re left to marvel at how adorable and wonderful this moment is! 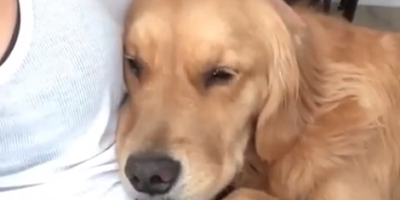 This short video was originally posted to Louie’s Instagram, goldenloutriever, and it quickly rose to viral Internet fame. People just can’t get enough of how cute the pup is! See what all the fuss is about and don’t be surprised if Louie steals your heart, too! This Adorable Pup Is Anxiously Waiting To Lick His Favorite Treat – Peanut Butter!